Ashiq Hussain, and the products in which bear his name, came to Harrison Mann needing help with his new product offer. As a new company, he knew that he had to have the correct look and feel for his company in order to attract the right kind of retailers for his products. Ashiq Hussain needed a strong logo and packaging materials in order to stand out and attract retailers to stock this high-end focus honey product. We needed to differentiate the brand with a logo which made his company look both modern and well-established. We researched the current marketplace, brands, and products, and then came up with a range of logos that would help the company with its launch. We also had to develop a design system that would evoke the uniqueness of the products and would create clear cut-through on shelf to allow consumers to easily distinguish from the rest of the market. We also designed the packaging for the extensive range of honey products; each had to have the same branding and elements in order to be recognisable within the Ashiq Hussain product range. A strong colour palette was chosen in order to highlight it well. 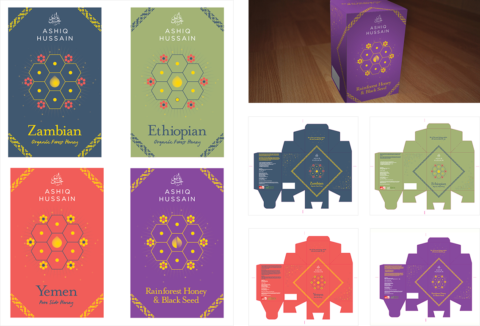 We helped Ashiq Hussain gain entry into a competitive industry with an assortment of visually modern packaging for his range of luxury honey products from the middle-east. I really needed to differentiate my products from the rest of the market and to enable us to approach large retailers in order for them to stock our products. The results have been overwhelming, all down to the new logo and updated product packaging. I would contact Richard at Harrison Mann if you require any graphic design completing.